As if playing host annually to Devil's Night each October weren't enough, Detroit has another ghoulish problem on its hands as bodies pile up in the county morgue. 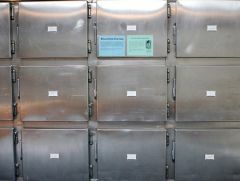 With so many families out of work and the city's coffers strapped, no one can afford to bury the 67 bodies that have accumulated at the Wayne County Medical Examiner's building. So for now, the bodies remain frozen. The morgue's chief investigator, Albert Samuels, told CNNMoney.com that he hasn't seen anything like it in the 13 years he's been on the job. "Some people don't come forward even though they know the people are here," said Samuels, a former Detroit cop. "They don't have the money." Last month, the body of Nancy Graham was among the corpses being held in the deep freeze. Graham's nephew, Darrell Vickers, along with his wife, Cheryl, didn't have the $695 needed to have Graham cremated. Other family members weren't able to help either, so Graham's body, No. 67, remained in the morgue. "It's devastating to a family not to be able to take care of their own," said Darrell Vickers, who along with his wife went down to the morgue to identify his aunt's body. "But there's really no way to come up with that kind of cash in today's society. There's just no way." One consolation is that at least Graham's body had been identified. Dozens of others remain and can't be disposed of until a family member comes forward or until the county's burial fund is replenished when a new budget is approved. Cash-strapped, the city can't afford to the help families such as the Vickers. "The failure, through inability or choice, to bury the deceased is a reflection of the economic conditions that have arrested this region, where people are now forced to make emotionally compromised choices," said a spokesman in a prepared statement given to CNNMoney. Detroit, with its ties to domestic car manufacturing, has the nation's highest unemployment rate among big cities. In September it stood at 17%, according to the Bureau of Labor Statistics. While the city has no money to aid with burial costs, the state does. Of the $4.9 million budgeted for such assistance in 2009, about $135,500 remains, CNNMoney reported. Those in need of assistance can find grant applications at Michigan Department of Human Services offices, most funeral homes, and at Michigan.gov/dhs. The Vickers were unaware of the assistance funds, but have since found the money to have Graham cremated with help from Social Security, social services and his aunt's church. Still, it's given Darrell Vickers pause when he thinks about all billions of dollars that have been allocated in economic stimulus. Sparking the economy to sell cars seems inappropriate, he told CNNMoney, when"We can't take care of our own when it comes to laying them to rest and letting them rest in peace."